A while ago, I was working with my client Hanna who confessed to strongly disliking her built-in bookcases on either side of the fireplace. At first I thought she was crazy and offered to switch homes! I explained to her that I had a fireplace with blank walls screaming for built-ins on either side, and I’d take hers in a heartbeat. We had a good laugh over the matter and she explained that it wasn’t the actual bookcases she despised, rather the idea of decorating them. I could see where she was coming from. They were quite large in scale, painted white and the shelves were flimsy looking and spaced far apart. This left a tall area on the shelf to be styled and created a challenge to bring the room to life. However, with a few recommended changes and a lesson in accessorizing, she was able to turn the built-ins around and create the living room she desired. I wish I could tell you that I have remarkable before and after pictures to show you, but at that time I was not good at documenting projects (I’m getting so much better- I promise)! Nonetheless, I can share the details with you. When styling bookcases, there are some techniques I always consider to achieve great results. Whether you’re a true traditionalist or lean towards a contemporary or modern aesthetic, the formula is basically the same with a few modifications. Are you starting out with a sturdy, well-built piece? Are the shelves fastened securely? Is the overall effect balanced and in proportion? If you’re planning on holding books and heavy objects, your bookcase cannot look like it’s ready to fall over! In Hanna’s situation above, the shelves were spaced too far apart and shallow for the height of the built-ins. I recommended adding two more shelves to either side and facing each shelf with 1.5” trim to beef them up. That created better spacing between the shelves and gave them the substantial appearance to be able to “hold” objects securely. Is the finish in great shape and does it complement the look you are trying to achieve? If you’re going for a light-airy look and your bookcase is stained dark, it’s not going to work. Paint it out in white or another light color. In the case above, Hanna wanted a Ralph Lauren look- classic, yet rustic. I suggested painting out the backs of the bookcase in a color two shades darker than the rest to tone down the white and give a little depth. Another option was applying seagrass wallpaper in a similar shade. In addition, think about contrast. If you know the accessories you’re going to use are white and the bookcase is the same, they’ll basically disappear. Painting out the back in a brighter color or wallpapering in a small repetitive print will make the objects pop. Lighting enhances a space so much and can be added in several ways. If your shelves are glass, install interior lighting at the top of the bookcase. If possible, hang sconces on either side of the bookcase or use candle options if wiring is an issue. Consider library style sconces hung above the bookcase if space on either side is an issue or use a lamp placed on one of the shelves if there’s room. In Hanna’s living room we were able to replace an existing brass ceiling fixture centered above the fireplace with a larger oil rubbed bronze track light that we directed toward the bookcases on either side. Selecting the right accessories for your bookcase can be tricky. However, if you take a picture of your bookcase and print it out or make a sketch on a piece of paper with the dimensions, you can have it by your side while you’re sourcing. 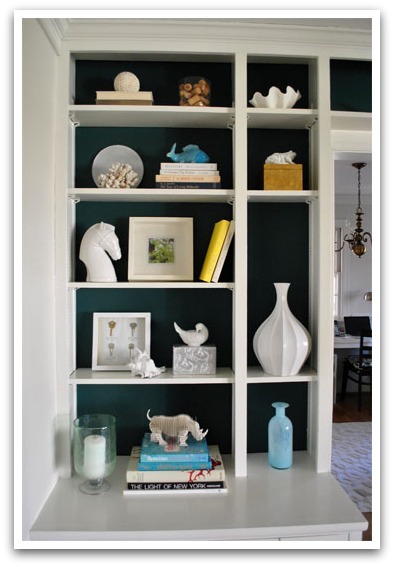 When choosing accessories for your bookcase, consider the elements- fire, water, earth, metal, and wood. Each of these should be balanced within the room using color, shape and texture. If there is too much of one element, it will seem a bit off. FIRE represents passion and energy- candles, red color, triangular shapes, lamps, pictures of people, etc. EARTH represents grounding us- stone, “earth tone” pottery, sisal and seagrass (wicker), colors yellow and brown. WOOD represents growth- plants, rectangular shape, color green, floral pictures or fabrics, frames, wooden objects. METAL represents strength- light colors, electronics, and metal objects such as frames, bowls. WATER represents flow- glass, colors blue and black, crystal, flowing patterned fabrics. When shopping for accessories I look for a tapestry of textures- trays, candles, leather, metal, glass, pottery, natural elements (e.g. shells or mother of pearl), plants (orchids are always nice), something woven, books, covered boxes, small art pieces, etc. These items should relate, but vary in size and shape. Take a look at what you already have. Choose items that “speak” to you and tell your story. They should be representations of the past, present and future and should relate to your lifestyle. In Hanna’s case, she used varying items from nature to represent the rustic quality she was after. Remember that it may take a while to find the “right” piece for a particular area and that’s okay. You want it to look curated and not straight out of the pages of a catalog. Start with heavy objects on the bottom and work your way up. If you’re styling two bookcases, work on the shelves at the same level on either side, making sure the items have the same weight. Items usually look best in odd numbers such as 3’s and 5’s. However, they don’t have to be the same piece. In addition, vary the number of objects on each shelf to make it more interesting. Consider leaning artwork or hanging on the face of a shelf. Vary the height of objects creating movement on the shelves. Don’t fill the shelves. Think about the negative space each object creates. For example, place books loosely in some spots and tight in others or stand some up and lay some horizontally. For a modern look, leave the shelves more sparse. Add layers for traditional. It will take a while to get it just right. Play around with items until you’re happy with how it looks. Remember that in most cases, less is more. Et Voila! You have yourself a beautifully styled bookcase! These are great tips! I just spent the last 2 days rearranging my shelves. It’s so funny how introducing one new thing throws off the balance of everything and all the shelves end up having to be rearranged. I love the example pictures that you showed. They’re so beautiful and inspiring. Thank you Brooke! I agree that it can be challenging getting it just right, but it’s nice to mix things up. I think it brings a new energy to the space when you introduce something new or move things around. I’m sure your shelves look fantastic.